GNE myopathy also called as distal myopathy with rimmed vacuoles (DMRV), hereditary inclusion body myopathy (hIBM), quadriceps-sparing myopathy or Nonaka myopathy is a clinicopathologically distinct distal myopathy with autosomal-recessive inheritance. It is clinically characterized by preferential involvement of anterior tibial muscles and sparing of quadriceps and pathologically by the presence of rimmed vacuoles (RV) on muscle biopsy. ,, The age of onset ranges from 15 to 40 years. Patients generally become wheelchair bound between 26 and 57 years of age, on an average 12 years after the onset of symptoms. Serum creatine kinase (CK) level is normal or mildly elevated. The GNE gene mutations are known to cause this form of distal myopathy. , GNE encodes a bifunctional enzyme, uridine diphosphate-N-acetylglucosamine 2-epimerase/N-acetylmannosamine kinase, which plays a critical role in the production of sialic acid. GNE mutations are reported to be responsible for a lower level of sialic acid in skeletal muscles, which is postulated to be causative of the diseases. Recently, limb girdle phenotype is reported to be frequent presentation in patients with myopathy associated with GNE mutations. In the present report, we describe 9 patients with GNE myopathy who underwent GNE mutation studies. Genomic DNA was extracted from peripheral blood lymphocytes using the standard techniques. All exons and their flanking intronic regions of GNE were sequenced directly using an ABI PRISM 3130 automated sequencer (PE Applied Biosystems). The primer sequences used in this study are available on request. We used the GenBank NM_001190383 for the description of the mutations. We examined nine patients (six women and three men) who had weakness and atrophy of peroneal muscles with relatively preserved to normal power in quadriceps muscles. Onset of the disease was in the second or third decade in the majority and the mean age of onset was 26.7 ± 5.4 (20-36) years. Mean age at clinical examination was 32.3 ± 4.2 years (28-39). Mean duration of illness was 5.6 ± 4.7 (1-14) years. 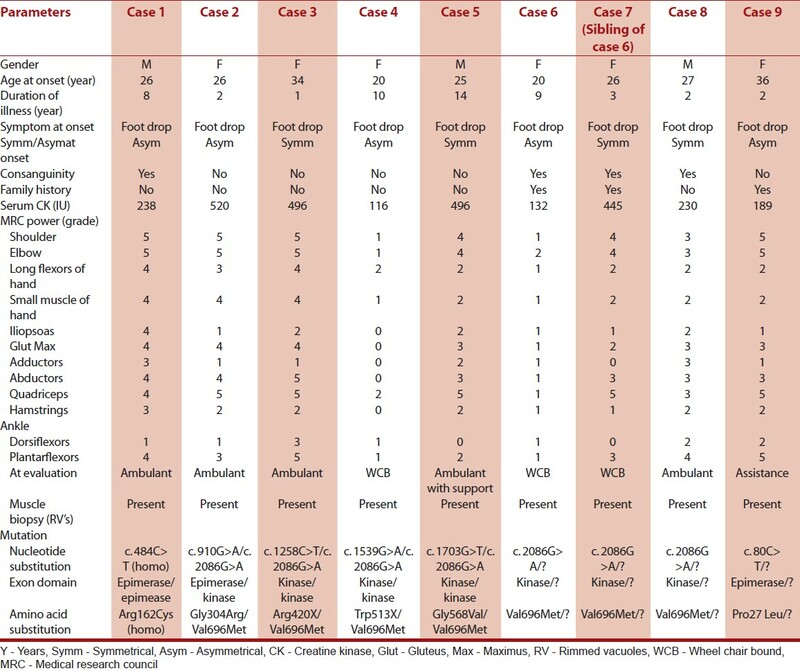 Details of the clinical manifestations, investigations and mutation findings are represented in [Table 1]. The initial symptom in the majority of the patients was altered gait. Muscle weakness was particularly prominent in tibialis anterior, hip adductors and hamstrings in the lower limbs with foot drop. Neck flexors were weak in majority. In upper limbs, distal and shoulder girdle muscles were more affected than arm muscles. The long finger flexors were particularly weak. Within months to a few years, the patients developed muscle weakness of the proximal lower and the distal upper limbs. All patients had minimal or no involvement in quadriceps muscles and was ambulant at the time of evaluation except for three severely disabled patients (case three, four, five and seven). Serum CK levels were normal to only slightly elevated. We identified mutations in GNE in all 8 families examined. One consanguineous family (F1) had a homozygousc. 484C > T (p.Arg162Cys) mutation, which is previously reported. Four had a compound heterozygous mutations including two novel missense mutations of c. 910G > A (p.Gly304Arg) and c. 1703G > T (p.Gly568Val) and two previously reported nonsense mutations of c. 1258C > T (p.Arg420X) andc. 1539G > A (p.Trp513X). A c. 2086G > A (p.Val696Met) mutation was commonly seen in our series and identified in the six of eight families (75%), heterozygously. Four patients in three families (F6-8) had only one heterozygous reported mutation. Familial vacuolar myopathy with autosomal-recessive inheritance characterized clinically by progressive distal and proximal muscle wasting and weakness beginning in early adulthood and almost always sparing the quadriceps femoris even in advanced stages was reported to occur in Jews of Persian origin. , The familial myopathy in Persian Jews has been considered to be an autosomal-recessive form of hIBM, which is now called as GNE myopathy. ,, Our patients all had the classical clinical and histopathological features of GNE myopathy. Nonaka et al., for the first time described three patients from two families of Japanese origin with autosomal-recessive inheritance and presence of RV in muscle biopsies. DMRV or now termed as GNE myopathy is a distinct clinical entity inherited through an autosomal-recessive trait with female preponderance. The mean age of onset in our group was 26.7 years and the initial symptoms of muscle weakness of the legs appeared in the majority in the second or third decade. In a review of 37 Japanese patients, the mean age of onset was 26.1 and onset in the third decade was noted in 64% of the patients. Clinically in seven of their nine patients in whom duration of illness was more than 10 years, five of them became non-ambulatory. Serum CK was mildly elevated or within the normal limits among the 37 Japanese patients. CK levels in our cohort were normal or minimally elevated. In GNE myopathy, presence of the common mutation is known to occur in different ethnic backgrounds, i.e. p.Val572 Leu mutation in Japanese and Korean patients and p.Met712Thr in the Jewish population. Findings in the present study and earlier studies, p.Val696Met substitution appears to be the most common mutation in both India and Thailand. In this study, four patients from three families had only one heterozygous mutation in GNE gene. The second mutation may not be detectable using the present method, which detects only large deletions in the GNE gene. In a previous study from Japan, patients with a nonsense mutation in one allele showed relatively severe clinical features. However, in this series, one patient (case 3) of 34 years of age harboring p.Arg420X/Val696Met mutation was ambulant, but had illness onset at 33 years of age while case 4 (30 years of age) with p.Try513X/Val696Met was wheel chair-bound after 10 years of illness duration. From the predicted structure models reported by Kurochkina, et al., p.Arg420X can preserve its epimerase activity and the enzyme hexameric state, whereas p.Try513X causes its conformational change on glucose binding if these proteins are produced. This study confirms that GNE myopathy may be indeed one among the common inherited myopathies among Indians. Further analysis in a larger cohort is required to clarify the genotype-phenotype correlations of GNE myopathy among Indian population. 1. Nonaka I, Sunohara N, Satoyoshi E, Terasawa K, Yonemoto K. Autosomal recessive distal muscular dystrophy: A comparative study with distal myopathy with rimmed vacuole formation. Ann Neurol 1985;17:51-9. 2. Argov Z, Yarom R. Rimmed vacuole myopathy sparing the quadriceps. A unique disorder in Iranian Jews. J Neurol Sci 1984;64:33-43. 3. Nishino I, Noguchi S, Murayama K, Driss A, Sugie K, Oya Y, et al. Distal myopathy with rimmed vacuoles is allelic to hereditary inclusion body myopathy. Neurology 2002;59:1689-93. 4. Nonaka I, Noguchi S, Nishino I. Distal myopathy with rimmed vacuoles and hereditary inclusion body myopathy. Curr Neurol Neurosci Rep 2005;5:61-5. 5. Arai A, Tanaka K, Ikeuchi T, Igarashi S, Kobayashi H, Asaka T, et al. A novel mutation in the GNE gene and a linkage disequilibrium in Japanese pedigrees. Ann Neurol 2002;52:516-9. 6. Argov Z, Tiram E, Eisenberg I, Sadeh M, Seidman CE, Seidman JG, et al. Various types of hereditary inclusion body myopathies map to chromosome 9p1-q1. Ann Neurol 1997;41:548-51. 7. Eisenberg I, Avidan N, Potikha T, Hochner H, Chen M, Olender T, et al. The UDP-N-acetylglucosamine 2-epimerase/N-acetylmannosamine kinase gene is mutated in recessive hereditary inclusion body myopathy. Nat Genet 2001;29:83-7. 8. Noguchi S, Keira Y, Murayama K, Ogawa M, Fujita M, Kawahara G, et al. Reduction of UDP-N-acetylglucosamine 2-epimerase/N-acetylmannosamine kinase activity and sialylation in distal myopathy with rimmed vacuoles. J Biol Chem 2004;279:11402-7. 9. Park YE, Kim HS, Choi ES, Shin JH, Kim SY, Son EH, et al. Limb-girdle phenotype is frequent in patients with myopathy associated with GNE mutations. J Neurol Sci 2012;321:77-81. 10. Nalini A, Gayathri N, Dawn R. Distal myopathy with rimmed vacuoles: Report on clinical characteristics in 23 cases. Neurol India 2010;58:235-41. 11. Nonaka I, Sunohara N, Ishiura S, Satoyoshi E. Familial distal myopathy with rimmed vacuole and lamellar (myeloid) body formation. J Neurol Sci 1981;51:141-55. 12. Mizusawa H, Kurisaki H, Takatsu M, Inoue K, Mannen T, Toyokura Y, et al. Rimmed vacuolar distal myopathy: A clinical, electrophysiological, histopathological and computed tomographic study of seven cases. J Neurol 1987;234:129-36. 13. Del Bo R, Baron P, Prelle A, Serafini M, Moggio M, Fonzo AD, et al. Novel missense mutation and large deletion of GNE gene in autosomal-recessive inclusion-body myopathy. Muscle Nerve 2003;28:113-7. 14. Tomimitsu H, Ishikawa K, Shimizu J, Ohkoshi N, Kanazawa I, Mizusawa H. Distal myopathy with rimmed vacuoles: Novel mutations in the GNE gene. Neurology 2002;59:451-4. 15. Ro LS, Lee-Chen GJ, Wu YR, Lee M, Hsu PY, Chen CM. Phenotypic variability in a Chinese family with rimmed vacuolar distal myopathy. J Neurol Neurosurg Psychiatry 2005;76:752-5. 16. Sadeh M, Gadoth N, Hadar H, Ben-David E. Vacuolar myopathy sparing the quadriceps. Brain 1993;116:217-32. 17. Askanas V, Engel WK. New advances in inclusion-body myositis. Curr Opin Rheumatol 1993;5:732-41. 18. Askanas V, Engel WK. New advances in the understanding of sporadic inclusion-body myositis and hereditary inclusion-body myopathies. Curr Opin Rheumatol 1995;7:486-96. 19. Griggs RC, Askanas V, DiMauro S, Engel A, Karpati G, Mendell JR, et al. Inclusion body myositis and myopathies. Ann Neurol 1995;38:705-13. 20. Sunohara N, Nonaka I, Kamei N, Satoyoshi E. Distal myopathy with rimmed vacuole formation. A follow-up study. Brain 1989;112:65-83. 21. Mori-Yoshimura M, Monma K, Suzuki N, Aoki M, Kumamoto T, Tanaka K, et al. Heterozygous UDP-GlcNAc 2-epimerase and N-acetylmannosamine kinase domain mutations in the GNE gene result in a less severe GNE myopathy phenotype compared to homozygous N-acetylmannosamine kinase domain mutations. J Neurol Sci 2012;318:100-5. 22. Liewluck T, Pho-Iam T, Limwongse C, Thongnoppakhun W, Boonyapisit K, Raksadawan N, et al. Mutation analysis of the GNE gene in distal myopathy with rimmed vacuoles (DMRV) patients in Thailand. Muscle Nerve 2006;34:775-8. 23. Kurochkina N, Yardeni T, Huizing M. Molecular modeling of the bifunctional enzyme UDP-GlcNAc 2-epimerase/ManNAc kinase and predictions of structural effects of mutations associated with HIBM and sialuria. Glycobiology 2010;20:322-37.